Frozen Diamonds runs on Microgaming Software and has a 20 paylines and 5 reels set-up. In terms of theme, the slot game follows a Winter Wonderland theme and has a great set of symbols and backdrop to match. The background is a frozen field while all of the symbols are traditional diamonds but with an arctic twist. Calming music plays alongside a frozen backdrop with an icy finish. The player can bet anywhere from 20p and £40 for every spin. All in all, it gives you a blast from the Antarctic with some great graphics and all of the symbols are in a chilled ice cube, so it looks pretty crisp and neat. Rabcat has gone out of their way to give this old theme a new look in Frozen Diamonds with a range of different gems as symbols. Everything from Green Emeralds, Red Rubies and Diamonds to the unique high-value wild symbol can be found. Higher value symbols are represented by the gems of certain colours. Gems that are purple, green, red and orange are of higher values while the rest are of lower values. Plus, there is also the colourfully oddly shaped diamond that represents the wild symbol. If a player is lucky enough to land on this symbol, it will replace the others to make a combination to earn more winnings. Frozen Diamonds has an odd-looking stone that is not like the others and has a very otherworldly look to it, as the wild symbol of the game. 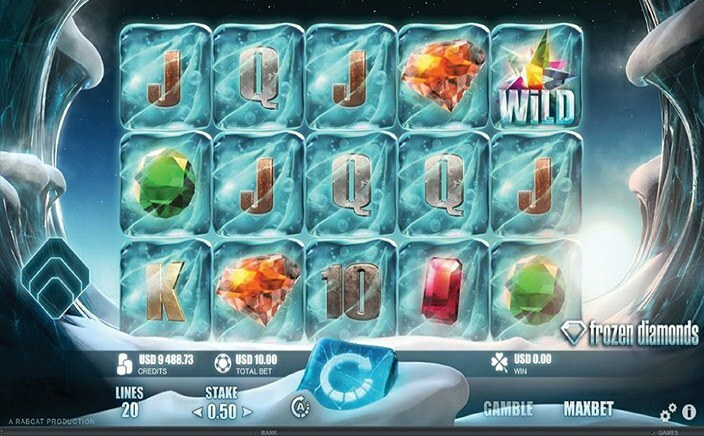 A unique feature from the Frozen Diamonds slot game is the tumbling down of symbols. If a player lands on a winning combination, winning symbols will be replaced by the ones tumbling in from above. After this, if the player manages to get three consecutive winning combinations they are eligible for some free spins. Five or ten free spins will be awarded depending on the luck of the player along with a few wild symbols on reel three. If a second tumbling is achieved, then another free spin is given to the player. The extra spins will have three wild symbols on reel three and a multiplier of 2x. 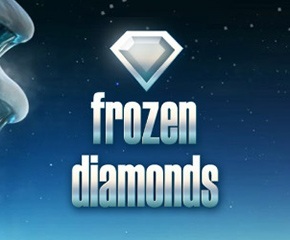 Frozen Diamonds is a nice slot game to try out if you are looking for clear graphics without much flashiness. There are also some pretty neat features that make the game exciting and allow you to hit surprising jackpots.